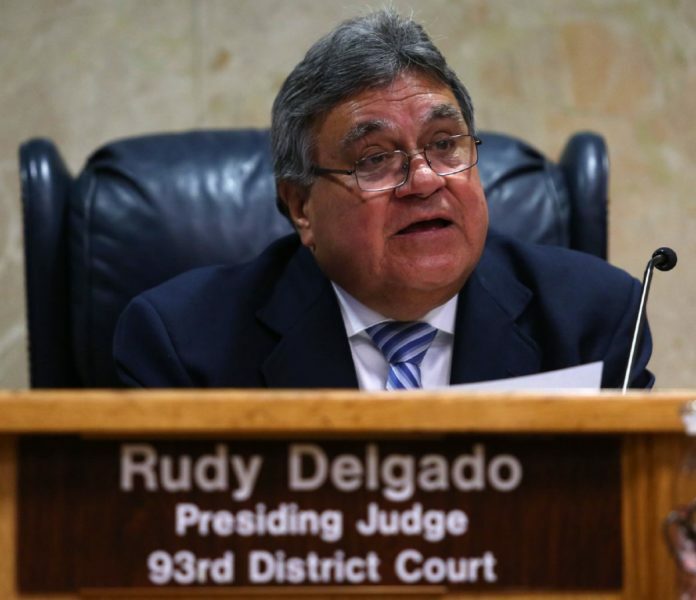 McALLEN — Citing the media attention the case has received among its reasons for conducting the trial in Houston, the government has filed its response to Rodolfo “Rudy” Delgado’s motion to change the venue of his bribery trial. Delgado’s attorney, Michael W. McCrum, filed a motion Aug. 7 to have the trial moved to McAllen, citing several of their own reasons. Among some of the arguments McCrum made are public policy concerns, the location and availability of his client’s witnesses, and what McCrum said would be a lack of a support system for Delgado if the trial were to be held in Houston. Delgado, who faces eight federal charges related to allegations that the former judge accepted bribes from attorneys and others in exchange for judicial favors in his courtroom, was arrested in early February and indicted the following month. The government, which earlier in the week changed the assistant U.S. attorney trying the case from Julie N. Searle to Arthur R. Jones, also pushed back on McCrum’s claim that holding the trial in Houston would “impede” the media’s ability to cover the trial — depriving the local community of press coverage of the trial. “The government anticipated that this case would garner significant media attention in the McAllen division, and it has. This coverage, coupled with the defendant’s profile in the community and status as an active candidate for judicial office, suggests that picking a jury without prior knowledge of the defendant or his charges will be challenging, if not impossible,” the court record states. McCrum also previously argued that the travel between McAllen and Houston is a “burden” on his client, and for the purposes of trial would be an inconvenience to potential witnesses. But the government, using Delgado’s own travel throughout the state, specifically to see his attorney and to visit one of his sons, as one of the reasons why the court should leave the trial’s venue in Houston, arguing that the former judge has shown that travel is not an inconvenience to him or his potential witnesses. “Since the defendant was charged in February 2018, he has engaged in significant voluntary travel to cities as far or nearly as far from McAllen as Houston. Furthermore, the defendant overstates of the difficulty of travel between McAllen and Houston — two cities linked by several daily relatively low-cost 75-minute direct flights,” the response states. McCrum claimed his client planned on calling at least 15 witnesses — the majority of whom live and work in McAllen. “It would cause an extreme hardship on such witnesses to leave their respective families and workplaces to travel to Houston…” the record states. The government responded to claims that Delgado would suffer “harm” during trial if he could not have his witnesses readily available and asked for a separate hearing where Delgado would have to offer proof as to what “admissible evidence” the witnesses are going to provide during trial. “Finally, the defendant asserts that he will present several witnesses who live in McAllen, but the defendant has no obligation to actually call any witnesses. Even if the defendant ultimately chooses to put on a defense, the testimony of many of his anticipated witnesses is subject to challenge and may be inadmissible,” the government’s response states. Delgado’s trial is scheduled for late February 2019.